An analysis of price performance of the online platform compared to Eastern States saleyard data and factors affecting prices received for online sales. A recent review our weekly cattle sales has given notable insights into the benefits of selling online. The analysis conducted by our Senior Data Analyst and Assistant Accountant, Harry Lim, has highlighted the value of online weekly sales. 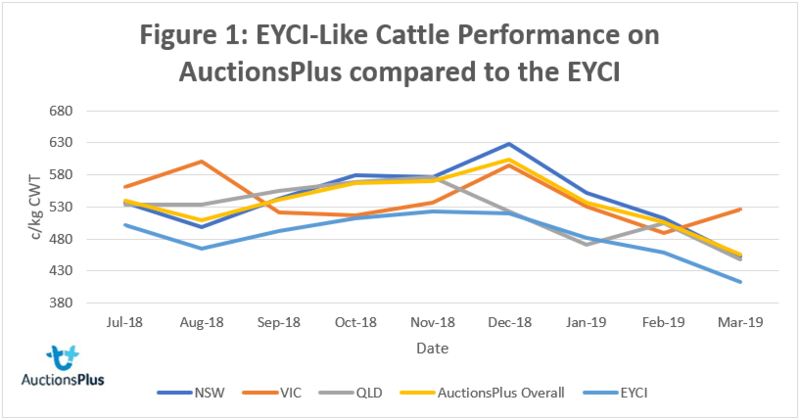 In comparison to the Eastern Young Cattle Indicator (EYCI), young cattle of the same description offered on AuctionsPlus from July 2018 to March 2019 averaged 10% better than the EYCI. This corresponds to an average 51c/kg cwt premium. AuctionsPlus prices for young cattle consistently out-performed the EYCI in all eastern states across this time period (Figure 1). This premium may be a result of several contributing factors; the volume of stock offered in each sale, the competition created through exposure on national platform, targeted sales attracting buyers or price control. The opportunity for vendors to set start and reserve prices, as well as placing higher expectations on their price point, may lead to sales having high pass in rate. However, clearance for online sales over this same time period average 81%, including post sale negotiations (Figure 2). Put simply, AuctionsPlus users can list young cattle with an 81% chance of selling and upon selling they will, on average, receive a 51c/kg cwt premium compared to saleyards. The first AuctionsPlus Weaner & Yearling Sale took place in 2016 with 4 stand alone sales. They were immediately successful in a strong and rising market, but initially lacked the consistent support they generate today. The sales slowed during 2017 until a campaign was implemented by current National Sales Manager, Mick Corcoran, who introduced fortnightly sales on the 1st of December. This decision was largely fueled by feedback from agents and producers, as well as from the success of the dedicated National Lamb Sales. These Weaner & Yearlings Sales were successful and well supported and in April 2018, they increased to weekly sales. The average sale size for fortnightly sales was just under 4000 head, which increased to over4000 head once the sales were rolled out on a weekly basis, essentially doubling numbers. It’s not all about the Weaner & Yearling Sale when it comes to young cattle gaining top dollar, the long-standing Eastern States Cattle Sale has also performed better over the same period (Figure 3.). 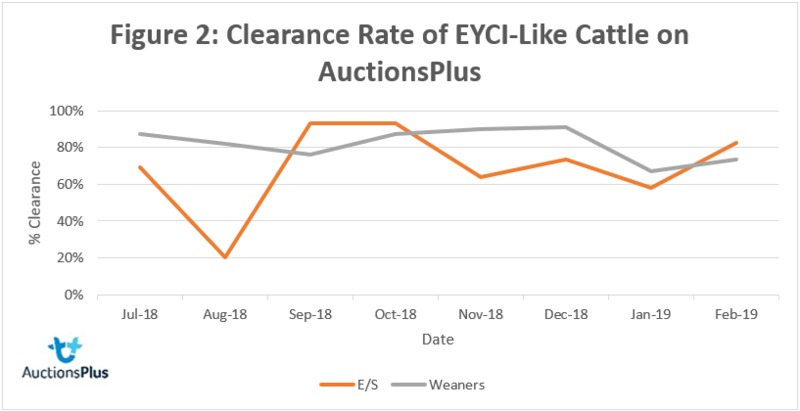 Although experiencing greater fluctuation, EYCI-like young cattle in the Eastern States Sale have averaged higher prices than cattle of the same description in the Weaner & Yearling Sale. This corresponds to 560c/kg cwt compared to 551c/kg cwt, or a 11.5% premium over the EYCI compared to 9.8% premium. On the other hand, when it comes to average clearance, the Eastern States Cattle Sale falls behind the Weaner & Yearling Sale with 69% clearance compared to 82%. The best possible explanation for this could be due to prices being skewed/driven by higher quality potential breeders being offered in the ES sales and attracting greater restocker activity. Pictured: Matt Baxter, Charles Stewart & Co, with the A/c ‘Eirenclare’ steers sold in the Weaner & Yearling Sale, October 26, 2018. 564 Friesian Yearling Steers, avg 322kg LWT, sold for an avg 388c/kg CWT, . Pictured: Krongart Pastoral Manager Jamie Catlin, with Snow Merrett, Penola and selling agents Thomas DeGaris & Clarkson's Sam Hill and Jamie Gray with weaners sold in the Weaner & Yearling Sale December 14, 2018. 287 weaner steers Angus & Angus X, avg 359 LWT, sold for an average 619c/kg CWT. The presented data represents a significant advantage in selling cattle in AuctionsPlus’ weekly cattle sales. This of course brings pleasing results for agents and vendors. 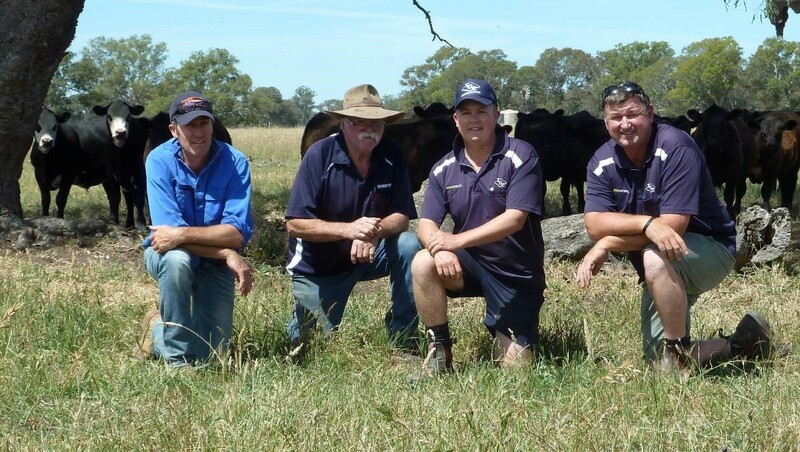 Matt Nelson, Charles Stewart & Co speaking on behalf of A/c ‘Eirenclare’, Mortlake VIC, told AuctionsPlus that selling online led to "Very, very happy vendors. probably wouldn't get that result anywhere else". 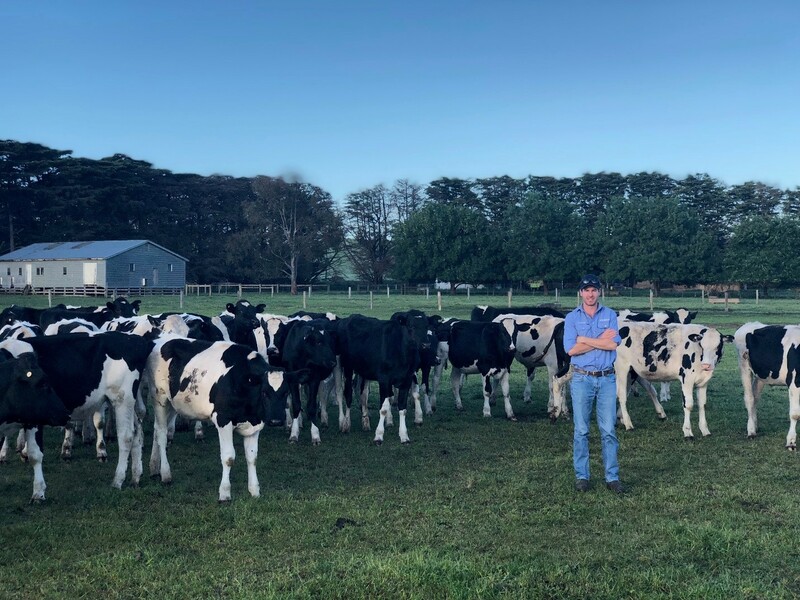 Pleasing results leads to both greater customer retention and repeat customers including Jamie Catlin of ‘Krongart Pastoral’ who sells his weaners every year on AuctionsPlus “they have been weaned and ready to go without the stress of the sale yards. We have received very favourable comments from previous purchasers online and see it (online) as the way to go”.